Despite the extreme antipathy shown toward religion by the educational establishment, the Chronicle of Higher Education doesn’t shy away from the topic. In the March 1 edition of The Chronicle Review, a piece by Candida Moss presents one of the uncomfortable facts of religious history to the academic world. Many of us who are “specialists” have known for quite some time that the record for mass persecution among early Christians is sketchy at best. In “The Myths Behind the Age of Martyrs,” Moss reveals that historical documents don’t present the first few centuries of Christendom as quite the blood-bath that early hagiographies do. It is true that perceptions vary depending on one’s point of view. If your auntie were thrown to the lions, it might look like everyone you knew was being persecuted. If you were a Roman historian, the numbers might seem small in comparison with, say, those pesky Carthaginians, heathens the lot of them. Still, it was this persecuted self-image that left a lasting imprint on Christianity. Until Constantine, anyway. When Christianity became imperial, it didn’t hesitate to get medieval on a few posteriors. As Moss points out, early Christians (as well as Jews and those of other bookish traditions) rewrote their stories over time. Even altering the Bible—not yet the Holy Bible—was fair game. The whole discipline of textual criticism grew up to answer the question of what the original Bible likely said. As soon as believers take their writings as factual, however, the story will change. 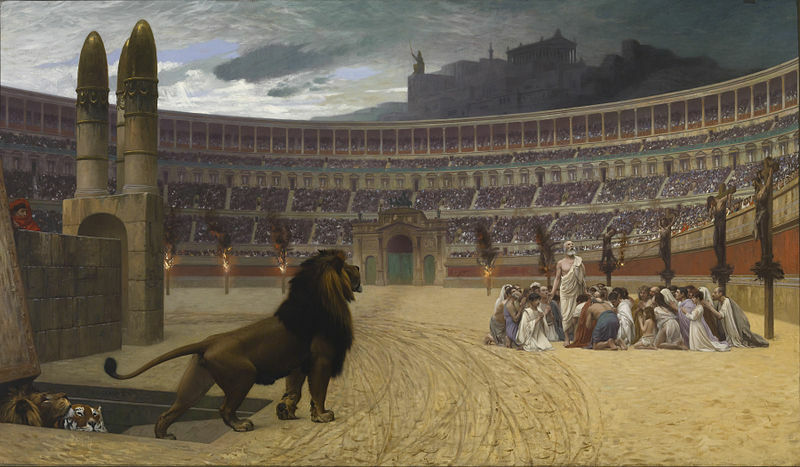 Were early Christians persecuted? Almost certainly. By the tens of thousands that tradition asserts? Less likely. The Romans were practical. Like most domineering classes, lording it over someone isn’t nearly as satisfying when your subjects are dead. You want that superior feeling? Keep the masses in servitude. But alive. That’s not to say that it didn’t feel like everyone you knew was being murdered for trying to do the right thing. When I was little, I was taught that it is more important to put others’ needs and wants in front of your own. It is a basic Christian teaching. Somewhat naively, I approached the academic empire with that simple basis deeply embedded in my mind. I didn’t realize just how often others would use this trait to their own advantage. Other Christians as well as the non-religious are happy to take from the willing giver. This didn’t prepare me well for life in the business world where, I am learning, the delight in taking from the giver has only grown stronger over the centuries. So I end each day spent and weary and feeling like I’ve been thrown to the lions. Not literally. Still, I believe in the plain idea that if we all treated others’ needs before our own the world would be a much better place. I’ve never outgrown my idealism. Until others join in, however, I’m sitting in the stands trying hard not to watch what the lions are doing down below. I’ve been tweeting the Bible. Many years ago I lost track of how many times I had read it, but tweeting seems to be a way to examine the text carefully, 140 characters at a time. As a college student who’d recently learned about textual criticism (many years ago), I approached my local pastor and asked him if we could try something at church. I had a big, old, black leather Bible set up in the vestibule and made announcements—and even had it printed in the bulletin—that we were going to copy the Bible. I placed a three-ring binder and a pen next to the Bible, and I asked the parishioners to write down a verse in the notebook on their way in or out of church. I wanted to see how long it would take, and to give the laity an idea of how difficult it was to copy accurately. (Hey, I was young and idealistic!) The Bible sat there many months, perhaps a couple of years. I would occasionally check on progress, and was surprised to see we were still in Genesis. We hadn’t even reached the flood yet. And mistakes? Ye gods! It was like the Bible had been written on another planet. I now see the many problems with the way the experiment was set up, but copying the Bible is a revealing exercise nonetheless. My tweets are with the King James Version of the Bible, and over the weekend I discovered something. According to the KJV, seed-bearing plants are male. Note Genesis 1.11 “Let the earth bring forth grass, the herb yielding seed, and the fruit tree yielding fruit after his kind, whose seed is in itself.” This corresponds to a post I wrote late last year about the notion of distorted masculinity in the biblical worldview. The operating assumption seems to be that male and seediness go together. Since the Bible is literally right, somebody better get out there and explain the facts of life to the female plants that constitute roughly half the flora on this planet. Herein lies the rub: ancient assumptions no longer hold sway. Trees are not all “hes,” and yet many treat the surrounding context of a literal seven days (only one day in Genesis 2) as worthy to take down science itself. Once in a while I have my own gripe with science—or at least its cousin technology. I was looking forward, many years down the road, to putting all my Bible tweets together into a seamless whole. The tweet I twittered on Sunday, however, never appeared. I can’t go back and add the missing 140 characters now, because that would throw the order off. And those ancient scribes thought they had it hard! Maybe there is an object lesson at play here. Maybe the utter devotion to a text has the potential to lead the righteous astray. As a society we’ve built a tremendous world of luxury around ourselves (well, most of us), and isolated ourselves from the wild animals and masculine fruits of biblical times. And yet, when we look at the text up close, we often find things we might not expect. Or even support. I will dutifully carry on my Bible tweeting, but like any human venture, my Bible will never be perfect.